On a cold Friday afternoon behind the FBI Academy field house, new agent trainees are shivering in a single-file line waiting to get blasted in the face with oleoresin capsicum—a substance more commonly known as pepper spray. When it’s Liz’s turn, she waits with her eyes closed before the instructor asks if she’s ready. There’s no count to three or warning noise. Before she knows it, her face is burning. To pass this test, Liz has to open at least one eye, attack a punching bag, and defend herself from an assailant who’s trying to take her pistol out of its holster. Amidst the chaos, Liz manages to subdue her subject, and the excruciating exercise is over. It’s one of the final tests at the Academy. Up to this point, more than 800 hours have been spent in and out of classroom learning what it takes to become a special agent. Trainees have worked together, studied together, and sweated together to complete one of the most challenging experiences of their lives. Now, it comes down to one last event: receiving their FBI badge and credentials on graduation day. Follow a class of trainees as they spend more than 20 weeks at the FBI Academy in Quantico, Virginia, where they’ll learn what it takes to become a special agent. 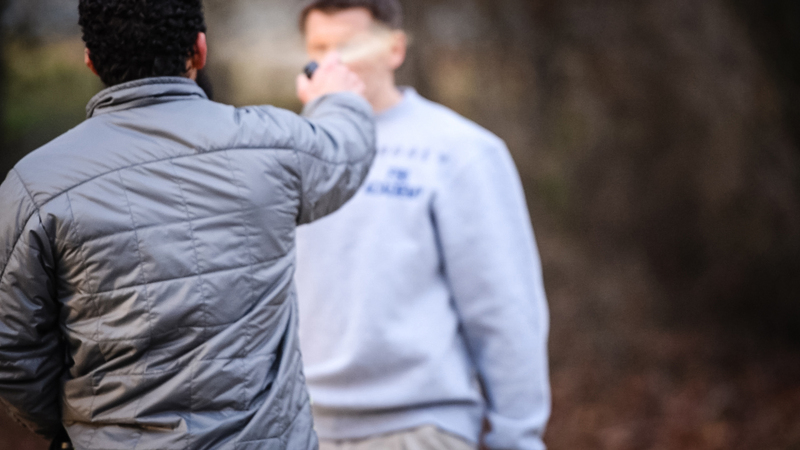 In one of their final tests before they graduate from the FBI Academy, new agent trainees are pepper sprayed to learn how to carry out their duties under a variety of challenging scenarios in the field. It’s a crisp morning in January as hundreds of people file into the auditorium at the Academy. Friends and family members—who have made their own sacrifices over the past five months, with plenty more to come—take their seats and wait in anticipation for their loved ones to officially become special agents. After being sworn in, Liz makes her way to the wings of the auditorium with the rest of her classmates. Clad in suits, they’re all now standing in line, waiting excitedly for their turn to go on stage and complete their journey at the Academy. Like the rest of her classmates, Liz couldn’t take her eyes off the shimmering gold FBI badge and credentials she now held in her hands. She made it. Now she will head to her first field office in Chicago, where her career as a special agent begins. Following the graduation ceremony, before new agents can pack up their belongings and head out to their new field offices, there’s just one final item to complete: a stop by the weapons vault to pick up their very own FBI-issued pistol and ammunition. It’s a fitting final lesson on the seriousness and importance of their coming work—protecting lives, putting dangerous criminals and terrorists behind bars, and safeguarding the nation. While the graduation ceremony serves as the culminating event for the new agents who have spent countless hours preparing to serve the country, training never stops. 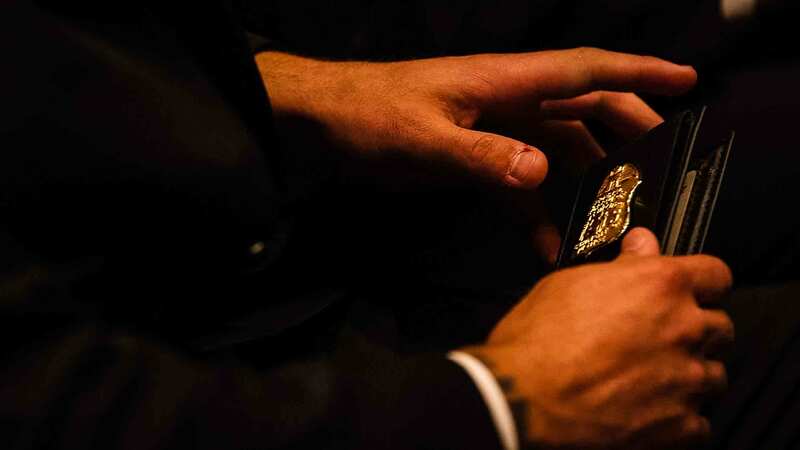 As Supervisory Special Agent John Woodill puts it, special agents in the field are constantly striving to improve their tradecraft as they move from assignment to assignment. Individuals assigned to public health cases, for example, must understand the complexities of the industry and the types of violations that may occur. “There’s no success for any individuals who remain locked into certain mindsets as they go about their careers. Lifelong learning is absolutely essential—otherwise, things could get dangerous if you don’t stay on your game,” said Woodill. Following graduation, new agents report to their first field office, where they’ll be on probation and are assigned a training mentor. Over a three-year period, agents must reach specific checkpoints and objectives before they can operate more independently in investigations. The integrated training of new agents and analysts at the FBI Academy replicates what they will experience in their coming cases and prepares them for collaborative work in the field. The law enforcement skills portion of the curriculum at the FBI Academy—which includes realistic exercises and intense tactical training—is very demanding and replicates what new agents might encounter in the field. The graduation ceremony at the FBI Academy marks the culmination of 20 weeks of hard work and sacrifice, when new agent trainees officially become special agents of the FBI. An alert citizen and strong law enforcement partnerships helped dismantle a robbery crew that kidnapped jewelry store employees to facilitate multi-million-dollar heists.